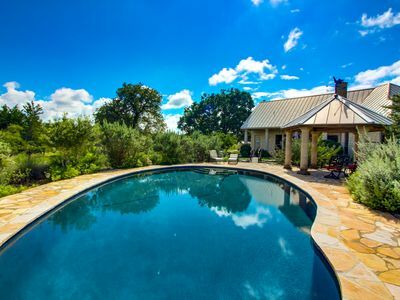 Enjoy a retreat to the Poco Loco Ranch - 250 acres of breathtaking land, nestled in the Texas Hill County on the Guadalupe River. 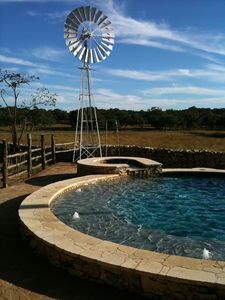 Just 10 minutes from Boerne, the Poco Loco Ranch is the perfect place to escape from the hustle and bustle of daily life. 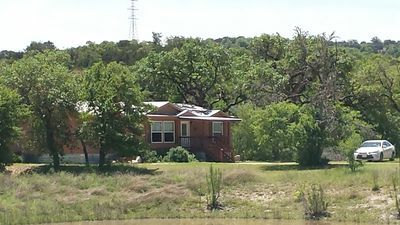 The long meandering banks of the shaded Guadalupe River will entice you to swim, tube, splash, fish, or just enjoy the quiet solitude. For a longer jaunt, float downstream on an inner tube – the public bridge is about an hour away. 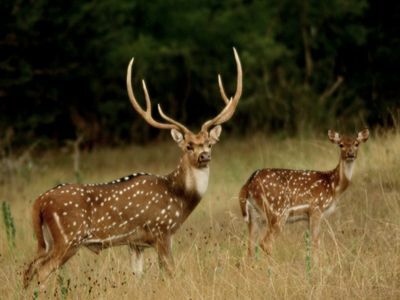 Hiking, bird watching and diverse wildlife will renew your spirits. 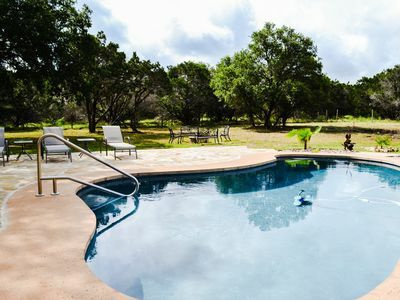 Best of all, at the end of the day lie beneath the vast skies and watch nightly shooting stars while swimming in our large new pool and enjoying our hot tub! 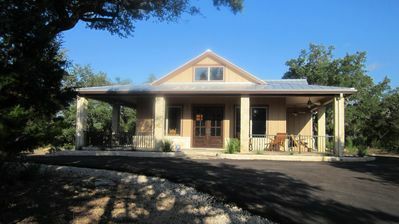 The Poco Loco Ranch has a rustic main house, a guest house and a fantastic separate game room. 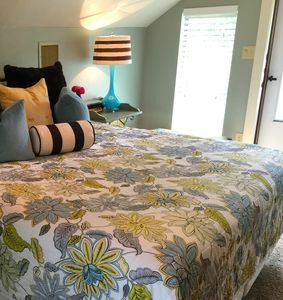 The main house has a large living room, kitchen, 3 bedrooms, (2 with king size beds, and 1 with two twin size beds) and 1 ½ baths. 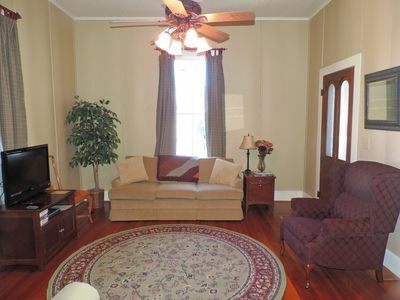 The living room has 3 sitting areas (including 2 fold-out sofas), a large flat screen t.v., and two tables for dining. 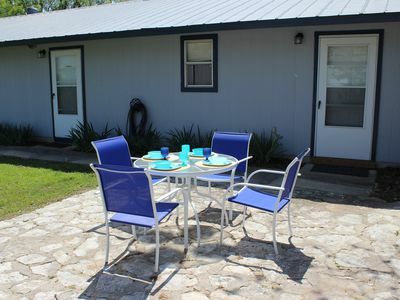 The covered front patio has two seating areas, 5 tables with chairs, 3 ceiling fans, and usually a nice breeze. There is an outdoor Grill and a separate Smoker for BBQ cooking and entertaining. 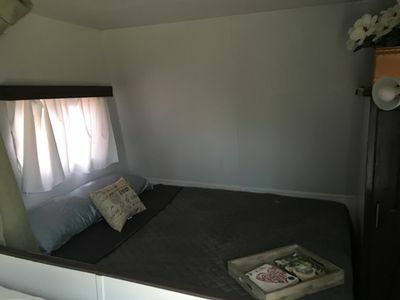 The guest house has a large bedroom with a sofa area, 2 queen beds, a full bathroom, a kitchenette, and a small dinette. The huge game room is spectacular. 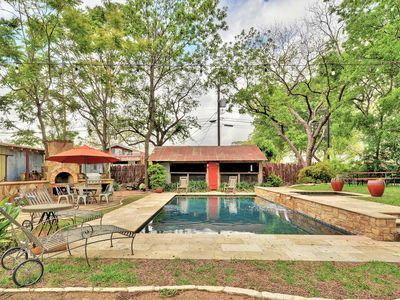 It has a beautiful antique pool table, a 22’ championship Shuffleboard table, a “Whirlwind” Pinball machine, Ping Pong table, air hockey, foos ball tables, and a sitting area with two sofas. 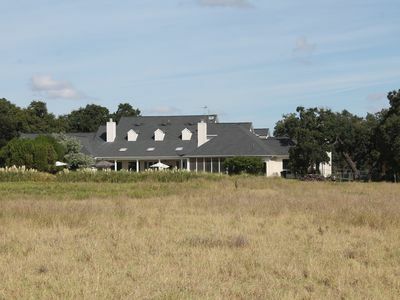 All three structures have fireplaces and a second patio is centrally located between the ranch houses. 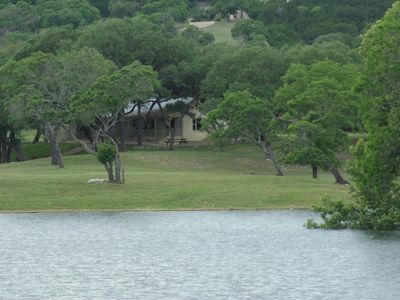 Onsite activities include Hayrides, BBQ cookout, bonfire, horseshoe pits, volleyball, and more. 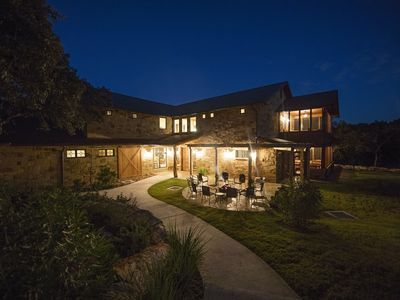 The Poco Loco Ranch is only ten minutes from the charming antique shops and cafes of Boerne, five minutes from The Cave Without a Name, twenty minutes from Fiesta Texas, and minutes more to Sea world and the famed Riverwalk of San Antonio. 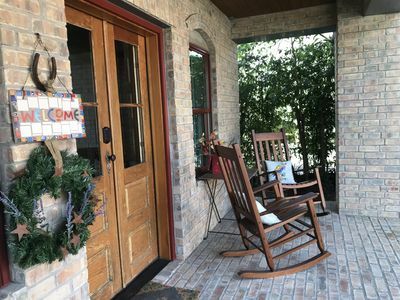 To the north, the World War II Nimitz Museum and the wineries and craft shops of Fredricksburg are about 45 minutes away. 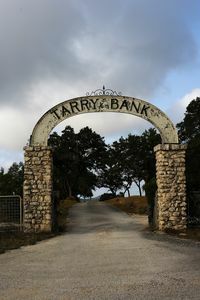 Great lodging for area weddings - Minutes from Serengeti Resort, Marquardt Ranch, Paniolo Ranch, Boerne, Bergheim, and Sisterdale. 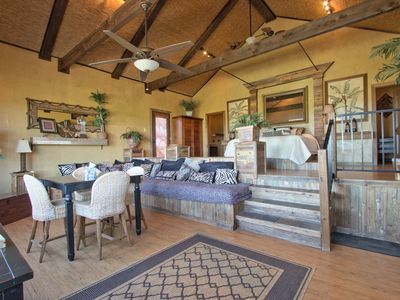 Enjoy a “Poco Loco Ranch” experience! Please note that to avoid warming our pool water, our spa heater will be turned off during the summer months. PERFECT COUPLES GET AWAY! 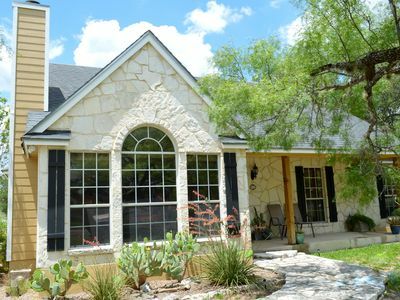 ALSO, check out our new property #1496089. 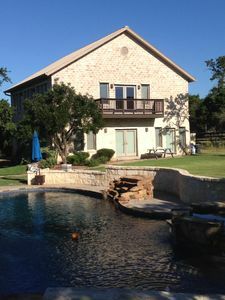 Spectacular Hill Country Home w/ Private Pool on 7+ Acres! 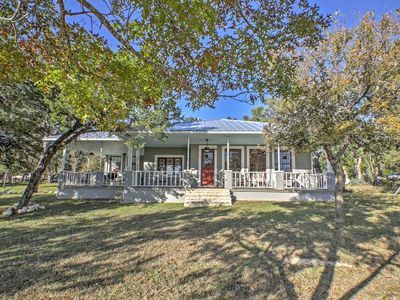 Hill Country Getaway close to charming Main Street! 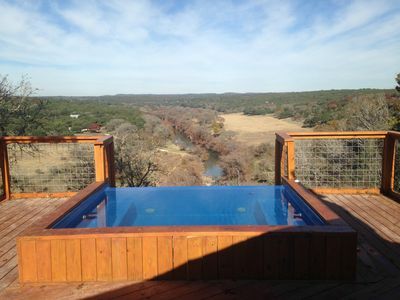 Hill Country Getaway On Beautiful Ranch Perched On A Cliff Over The Guadalupe R.
Unique Safari Style Bungalows with Pool, Fire-pit and Hill Country Views! RV in the country. Enjoy the outdoors!